One of the most interesting developments in the ceramic community in the last few years has been the emergence of individual glazing styles. In the beginning, there were two main “schools” of glazers. On one side you had those that used techniques developed by Joanie Berkwitz of Pour Horse, who had learned a great deal from her predecessors at Hagen-Renaker. 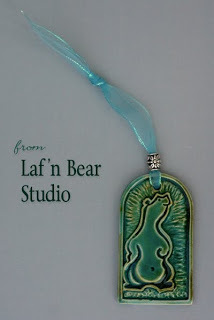 This type of glazing involved airbrushed underglazes. On the other side was the overglaze tradition common in the United Kingdom. Alchemy and Animal Artistry did a lot to popularize this type of coloring among equine collectors. Karen Gerhardt of Wizard’s Vale was perhaps the most unique in that she combined the American tradition of airbrushing with British overglazes. Within each school, the horses often looked quite similar. The medium itself is limited in both palette and technique, and there is a lot about ceramics that discourages experimentation. Glazes are unpredictable at best. Ceramic colorants are not pigments in the traditional sense. They behave a good deal more like chemicals than like paint, which means the rules that govern color mixing do not always apply. (Anyone who makes the mistake of using Cobalt Black on a horse will find that out quite quickly!) Add in the fact that many bisques are valuable, either in terms of rarity or time to create, and it takes a pretty brave soul to try something uncertain. But even with those obstacles, artists are bending the techniques to suit their preferred ways of working. New ideas are spread and small differences have begun to appear. I suspect that by gathering such a diverse group in Boise, we have probably accelerated that process. This was really evident in the recent post, “A Turning Point” on Sarah Minkiewicz-Breunig’s blog. On one level I found her post very amusing because I could relate to the problem of leaving a project too long. I also have horses that had been dropped mid-stride, and am having to navigate my way out. Even my underglaze mixes are, at the moment, a confusing mess. At some point I had stopped labeling each mix, probably because I could usually remember where I last had the bottle of nose pink, or that the bottle with the “good” flaxen tone had a grey and not a black lid. After a year of writing, those memories are gone. I don’t think I realized before just how many mixes (both realistic underglazes and colored art glazes) were some shade of pinkish taupe, but I am quite aware now! Even more, my method is fraught with madness. I’m a very chaotic artist who fares best—and creates best—when able to metaphorically go back and forth, up and down, in and out, and even sideways when creating a piece. It’s very difficult for me to think linearly, to think in terms of fixed procedural steps to accomplish a finished piece. Yet this is what underglazing is all about—starting at Point A and then following a specific sequence to Point Z. Many of the fixed nonnegotiable steps have been a big trip circuit for me because I create so much “in the moment” that I literally cannot see the road ahead of me—so I end up stuck in a lot of dead ends. But with the application of overglaze I now have the ability to teleport my creativity anywhere I want it to go; I can glaze as messily as I create! But perhaps more pivotal, I’m a painter who prefers a high degree of control in what I want to achieve (insanely so it could be argued). It’s that whole OCD thing. I become stressed and hesitant when I feel too much control is relinquished to the media, especially when so much time and energy has already been invested in getting a piece to that point. Sarah and I have worked together for years now, and I still remember being quite surprised by the realization that she worked in such a chaotic fashion. I suspect that many who are familiar with the precision with which she captures the equine form, and the level of detail she employs, would find her wide-open approach rather unexpected. I sure did! This realization also made me more aware that my own approach is very linear. The same requirement to follow a specific sequence from Point A to Point Z that makes it hard for Sarah to work is something that suits me. I am a planner. This is probably best illustrated by these images, which I suppose will reveal the extent of my own form of OCD. Before firing, the mixes that make this guy’s pink nose and his shell-colored feet look the same. 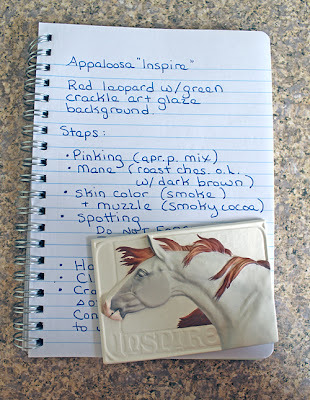 As the notebook in these pictures show, I map out my glazing in writing. I started doing this when I first began because I needed a way to double-check my steps. As Sarah mentioned in a previous post about the Taboo she was glazing, with underglaze you have to plan not only color sequences, but hand-holds. Underglazes are easily damaged by handling, with some more delicate than others. So each project requires an analysis of the order of color. Can the color be masked over? Detailed by hand? Will it “drop under” another color? How hard is it to etch? At the same time, consideration has to be made about what will be available to hold along the way, and what cannot be masked from overspray. Over time, some of this became second nature, but I still write things down. 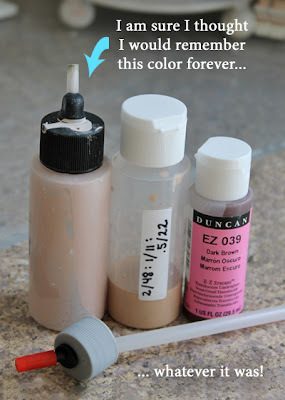 If nothing else, it allows me to recreate (or at least attempt to recreate) past color combinations. Sarah also mentions the loss of control. That is the paradox of underglazing, and the reason why I suspect it is an unusual artist that truly finds underglazing a joy. You need someone that wants to plan ahead, with the more attention to detail the better. But you also need someone who can, after doing this, let go completely. Once that piece is in the kiln, the element of chance enters. You don’t really get to pick the final color. Oddly enough, you can dictate precise details like the outline of a pattern, but things like tone and intensity are not much more than requests. The kiln decides, and in the end the medium is completely unforgiving because by the point you can actually see the final result, everything is sealed under the clear glaze. So how will my own work change? Unlike Sarah, I have only ever worked in linear, light-to-dark, unforgiving mediums. As a young artist, it was colored pencil and to a lesser extent, magic markers. Even when I did switch to acrylics, I painted in thin washes of color much like a watercolorist. I think that for an older artist, it is hard to change the basic nature of how you work. So perhaps the trick is to adapt new materials to established approaches. The tile at the top of this post was an experiment. Over the years I have begun adding more and more handpainted details to my glazing, because I am happiest with a medium liner brush. 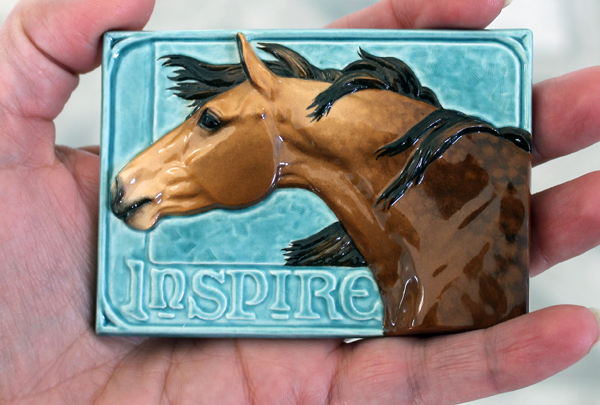 This is most obvious in the mane and tail detailing (the “streaking”) on my horses, and is slightly visible on the (very dark) mane on the tile. But almost all the coat detail was done this way, too. I used thin washes of underglaze to punch up the contrast in the darker areas, and to dapple out his coat. This is risky, because it is much harder to gauge intensity with this kind of paint application. It also introduces the possibility of disturbing existing colors or leaving a watermark. But knowing that overglazing can fix things makes taking that risk a little easier, and I believe the specificity of the tonal placement (while still keeping the overall effect soft) is worth it. I am more cautious and more linear in my thought processes than Sarah, but like her there is something about the energy of colleagues that can make a person a bit braver. The horses currently firing in my kiln represent some of the next steps in this process. It is an exciting time to be a ceramic artist! There is so much I want to share about the recent Bring Out Your Chinas Convention (BOYCC). 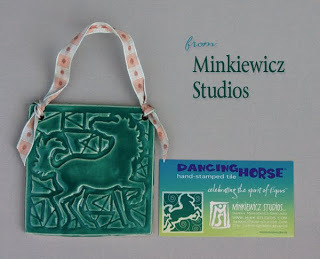 The format was an experiment conceived by Joan Berkwitz of Pour Horse Pottery and Addi Hude of Brightly Hude Studio, and there is so much to say about it that it will take several posts (and a few more days of sleep for my part). 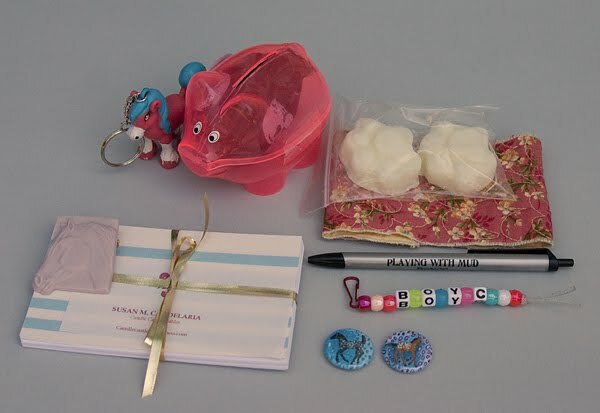 I did want to share some photos of the “Swag Bags”, which are pictured above. Those are actually the Day 1 Swag Bags. 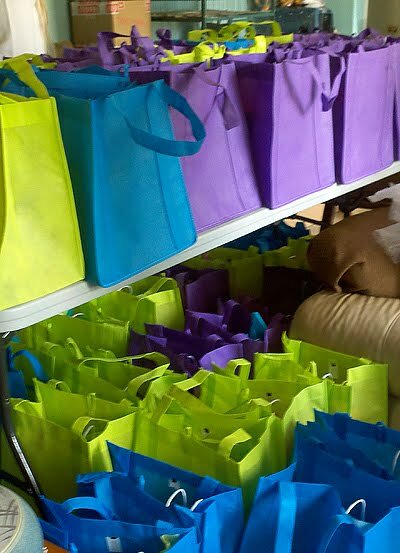 So many things were created as giveaways for the show that a second set of bags were required for the second day of the show! My own contribution – the handmade name tags discussed in previous posts – were actually handed out separately so that we didn’t have to match the bags to their owners. It was work enough just filling all the bags! 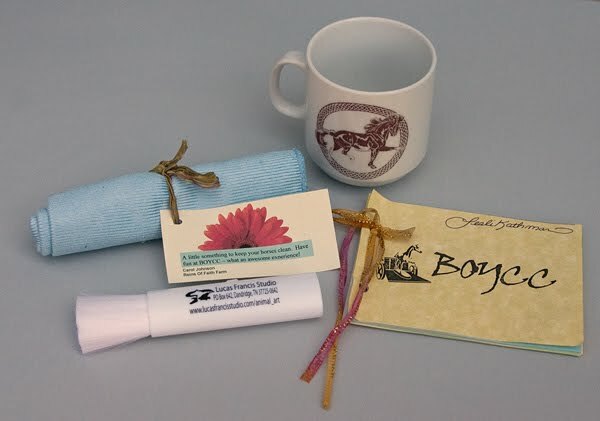 Here are a few of the items: a ceramic mug with one of the early Pour Horse logos. The roll of blue cloth is a lint-free towel for cleaning dust and debris from ceramics; these were extremely handy for those of us who took the workshop in china painting! The retractable white brush in front came from Kristina Francis. To the right is a memory book for attendees to sign. It was one of my favorite things from the event, although I am sorry that judging kept me too busy to sign as many as I wished. More swag! From the top left there is a cartoon pony keychain (my son already claimed it) and a plastic piggy with tiny dominos (again, claimed by my kids). The white paw prints are handmade soap, and they sit on a handmade koozie. There is a pen that reads “playing with mud” and a key fob that says “BOYC”. To the lower left are some index cards for last minute show entries (boy was I glad for those!). Sitting on top of those is one of Karen Gerhardt‘s pins in a pretty lavender porcelain. We used the same pin in glossy white for her overglazing workshop. (Mine is, not surprisingly, so far from done that there is no point in photographing it yet.) The two small buttons were done by Melissa Gaulding. She made enough for everyone to trade, and I ended up with two appaloosa foals. 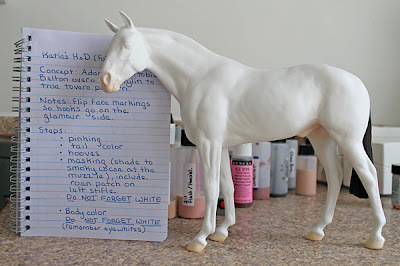 I am still kicking myself for not taking the time to find someone willing to trade the splash overo one. Lynn Fraley of Laf’n Bear sent some of her bear tiles. 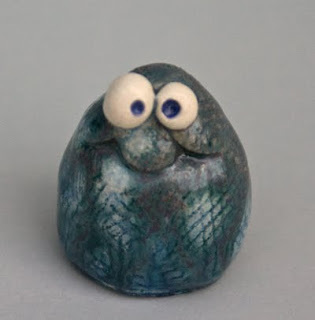 I really liked the blue-green glaze on this one. 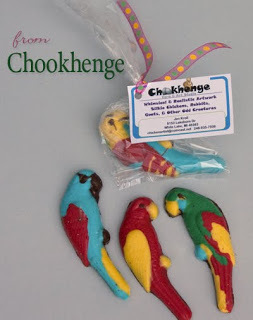 Another big hit from the swag bags were these candy parrots, made by Jen Kroll. She did a number of different color patterns and I was fortunate to take quite a few home. I didn’t have the heart to eat them, though. I couldn’t eat these, either. 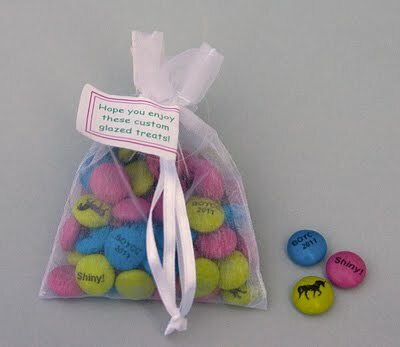 Liz Holm donated custom-printed M&Ms with “BOYC 2011”, “Shiny!” and a silhouette of the HR Morgan Stallion. I didn’t know that could be done, but here is the site for ordering them. I didn’t have to eat them, though, because the bags were filled with all manner of snack foods – and that was on top of all the meals that were provided as part of the event. And finally there was this guy. He was part of the booty Sarah sent down for the show. I had seen them on Sarah’s blog post and coveted them. My roommate Katie Gehrt won this one (my favorite!) as a door prize and gave him to me. It made my day! He sat next to my laptop during the horse color presentation, so that I would see him each time I changed a slide. It was almost like having Sarah right there, which of course made it impossible to be nervous. I will post more about the workshops and the show and the presentation in the next few days. I want to tell as much as possible about BOYCC in hopes that more people will consider using it as a template for future events.